Casio has announced that the UK market will gain a new limited edition model in its Celviano line of digital pianos, arriving in the Autumn and so available for the busy Christmas period. 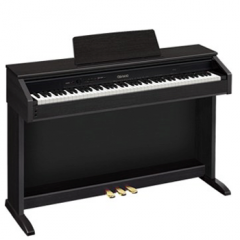 The Celviano AP-245 will feature much of the same technology as found in Casio’s other Celvianos, including the 88-note Tri-sensor keybed with simulated ebony and ivory key tops, A.i.R sound technology, a range of sounds, built-in recording, DSP (digital signal processor) effects, and USB connectivity for use with a computer. It will feature the superb glossy black cabinet with sliding key cover, and come with a three-year warranty. Andy Carvill, who heads the Casio EMI Division, said this limited edition model would offer “outstanding value for money”, suggesting it could also prove a significant boost for Britain’s Casio dealers. Expected to retail for around £500, it’s not clear how many of the AP-245 will be manufactured, but they’ll be available strictly on a first-come-first-served basis. We’re not sure whether it will also be available in other countries. There’s no definitive specification list at present but we’d expect it to be similar to the Casio AP-220.